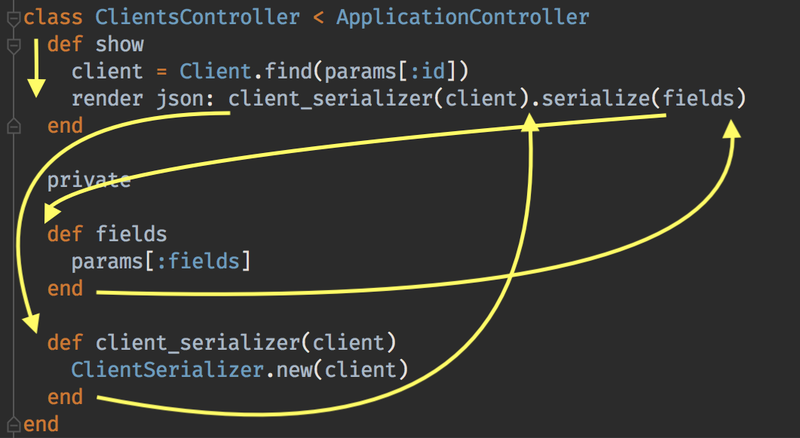 This may sound obvious, but every method definition results in +3 extra lines in a class. Lines of code are meaningless, right? No big deal. WRONG! You walked right into that one (grin). Lines of code represent a maintenance burden. They do matter, as they can add up quickly and turn a class that can be read easily in a single page into a long, choppy mess. I consider this particularly egregious when a variable definition would have been a single line. A good general rule is that if the number of added lines is more than the body of the definition itself, you are introducing more noise and less signal in your code. That’s a bad thing. If you’re counting that’s 7 lines of code rather than 16 lines of code. The furthest your eye might have to jump up/down is a single line. I cheated slightly in that I skipped creating a local variable entirely for param[:fields], because sometimes when you inline things you realize how little the label of a variable adds to understandability. Another version of this that I see a lot is using it for sharing memoized instances between methods. This has all the same problems I already talked about, plus it adds statefulness and unclear method dependencies into the mix. Representing it this way might even make it clearer that you never need to allow a nil client and could use ActiveRecord’s find or find_by! to tighten this up. If you were looking at the client memoizing method it’s not-at-all clear whether that is the desired behavior in every place that used it. Sometimes it’s important to re-use the same block of code from multiple entrypoints in your class. That’s fair. Keep in mind that some amount of minor duplication is ok, though. DRY is not about repeating lines of code, but about repeating ideas. If you can’t imagine extracting a small standalone class to represent that shared functionality, then you might not need a method either. I am not suggesting all extracted methods be classes, just a perspective to have when thinking about whether it truly belongs as a separate block of code. I have often seen the “only use extracted methods” approach in Ruby code, and never seen the “only use local variables” approach (which I do not advocate). There’s a middle path where using both extracted methods and local variables can help to make your code more readable, more maintainable, and easier to reason about. My aim here is to provoke you to think about it, and maybe tip the scales back into a better balance.